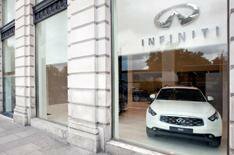 Infiniti opens London showroom | What Car? Infiniti has opened a new flagship showroom in London's Piccadilly. The Infinti Centre Piccadilly, in London's West End, is the luxury car maker's second dealership, following the opening of its inaugural UK showroom in Reading. Further centres are planned in Birmingham, Chiswick, Glasgow, Hatfield, Leeds and Stockport. The London dealership can accommodate just three cars, but has a similar 'boutique hotel' interior to that found in Infiniti's showrooms across Europe original artwork hangs on the walls, there are leather sofas, high-definition TVs and interactive computer terminals. Customers who buy a car from the Piccadilly showroom will still have to have it serviced in Reading. However, Infiniti offers a free pick-up and delivery service.